Abbott Cell-Dyn Sapphire In-Vitro Diagnostic Automated Hematology Analyzer . New Life Scientific, Inc. This Abbot Cell-Dyn Sapphire hematology analyzer powers on and was able to connect to an Abbott PC (not included with this system), but experienced various errors during operation. The internal components are in good physical condition and there is only minor evidence of spills from use. The overall good condition of this Cell-Dyn Sapphire makes it a great candidate for repair or part salvage. 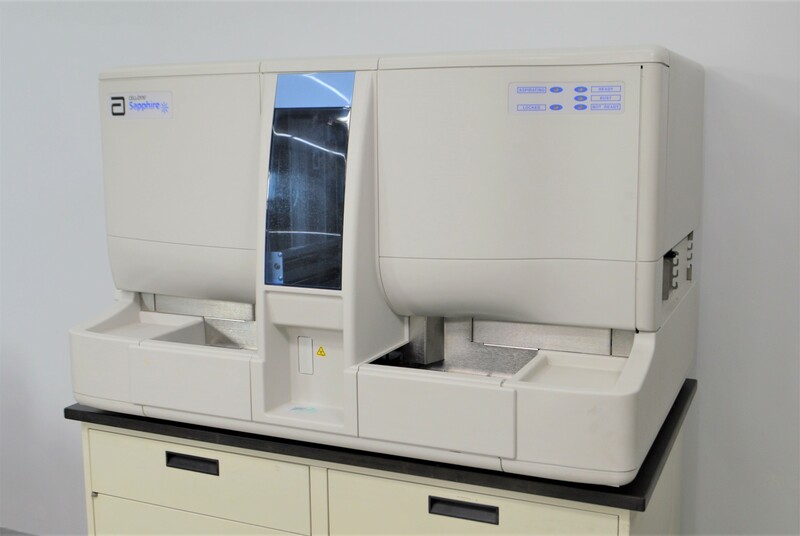 Our in-house technician inspected and powered on this Abbott Cell-Dyn Sapphire hematology analyzer, confirming it able to connect to an Abbott PC and home the motors, but various errors and an abnormally loud compressor occurred during operation. No further testing was able to be performed.